During their 5-0 bullying of little Freiburg at the weekend, the Bayern Munich supporters took a moment to acclaim their manager. "Jupp! Jupp! Jupp!" they roared in appreciation of Jupp Heynckes, the 72-year-old who has taken charge of the team until the end of the season in the wake of Carlo Ancelotti's sacking. Heynckes is a throwback to when Bayern were great. Truly great. At the end of his last spell as manager - his third - he created all sorts of history by steering his team to a Bundesliga, German Cup and Champions League treble. Not even his successor, Pep Guardiola, could match him. The Celtic game on Wednesday will be Heynckes' first European tie since the glory of 2013 when they beat Dortmund in the all-German final at Wembley. To the fans, Heynckes is not so much a prodigal son as a reassuring godfather. He exudes authority and has a capacity to inspire. "When he speaks, everyone listens," said Joshua Kimmich, the young Bayern full-back and scorer of one of those goals against Freiburg. "He exerts a sense of calm." From Thiago, another of Bayern's scorers from the weekend, we heard this: "We played as a team [against Freiburg] and it's been a long time since we played like that." Mats Hummels echoed the sentiment. "He has made it very clear what he wants and that means everyone plays as a team." There's been huge praise for Heynckes from Bayern's leading stars, a good number of them being part of the treble side he lorded it over. The subtext, of course, is that Bayern were not listening to Ancelotti in the way they listen to his replacement; that they weren't playing as a team under the Italian and that they weren't clear in what they were supposed to be doing. Ancelotti's departure appears akin to the removal of a dark cloud over the players. The relationship broke down this season and it was irretrievable. Thomas Muller, dropped and unloved by Ancelotti, previously said that his qualities are "not wanted" while adding "I don't know what the coach expects of me". Franck Ribery followed suit; Robert Lewandowski had harsh words for the direction the club was going in. It was a twisted mess. Now, Heynckes is restoring focus and order. In one game he has changed the way Bayern are set up, restoring Javi Martinez to the holding midfield role he occupied when they won the treble. Martinez is injured for the Celtic game - as are Manuel Neuer in goal and Ribery out wide. They won't be setting off the distress flares above the Allianz Arena just yet, though. Bayern's squad might be ageing - and is due a substantial reboot pretty soon - but they still possess the kind of ammunition that could account for all bar the elite of the elite in this competition. And they're playing with a smile on their faces again, which brings a sense of foreboding. In a perfect world, Celtic would have played Bayern before Ancelotti got binned. The players were moping, the manager was stressed, the fans were rebelling. Bayern toiled to a 3-0 win over Anderlecht in the opening round of the Champions League, but it was a misleading 3-0. The Belgians had a player sent off early. Bayern were a hard watch that night. Their 3-0 loss to PSG was the real catalyst for a management change. Hummels, Ribery, Arjen Robben and Kingsley Coman all started on the bench that night. Four stellar acts, as miserable as could be. It was noticeable that Heynckes love-bombed them all when he returned to the club for a fourth time. He called them big players and leaders. It's on an altogether different plain, but the 'bigging-up' of downbeat footballers is something Brendan Rodgers did himself when he joined Celtic. The clubs' budgets might be a world apart, but in the business of motivation Heynckes and Rodgers are instinctive operators. Celtic are heading into one of the most unforgiving stadiums in European football. Over the course of this season and the previous two seasons, Bayern have played 57 home games in all competitions and have lost only three - against Dortmund, Real Madrid and Mainz. They've drawn seven and won 47. The volume of goals they score on their own patch is the stuff of legend in Germany. Over the last three Champions League seasons at the Allianz Arena they have scored four goals against Olympiacos and PSV, five against Rostov and Arsenal [twice], six against Porto and seven against Shakhtar. 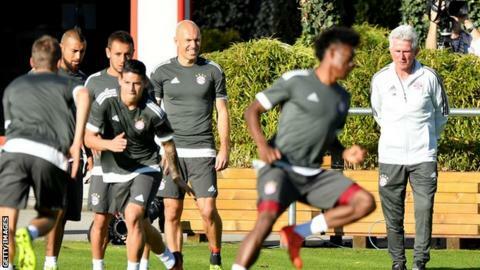 Jupp Heynckes: "The team is highly motivated and looked good in training"
In the Bundesliga last season [and again two seasons before] they got eight against Hamburg. For all their unhappiness this season, they've scored 30 times in 10 domestic games. They have an attack that can blow Celtic to kingdom come if the visitors aren't robust from the get-go. Even if Celtic are everything they can be, the question of how they stop Bayern's attack is the riddle to beat all riddles. Bayern might not have the majesty of PSG's nouveau riche trio, but they are a lethal force and have been doing it for years. Lewandowski remains a machine in front of goal for club and country. Forty-three goals last season, 42 the season before. Apart from Cristiano Ronaldo and Lionel Messi, nobody has scored more Champions League goals in recent seasons. In Muller, Bayern have one of the great German players. It seems like Muller has been around for an age at the top level. In fact, he's just turned 28. If Muller is getting his mojo back under Heynckes then that's a scary prospect because we know what Muller is like when he's happy. His goalscoring record is quite something given the different positions he's occupied over the seasons. From his 17 goals in all competitions in 2010-11 and the 10 he got in 2011-12, he's scored 23, 24, 26 and 37 in the past four years for Bayern and Germany. Robben, the third member of the triumvirate, is not as prolific but his goals and assists add up to a dizzying number pretty much every season. Robben is another player who adores - and is adored by - Heynckes. Ex-hurricane Ophelia did a bit of damage in the last few days, but a footballing storm is about to hit Celtic in Munich. "The team is highly motivated and looked good in training," said Heynckes on Tuesday. Bayern, their good karma seemingly restored by their veteran manager, will be focused to the high heavens. The visitors had better hold on tight.